These are but a few of the many adjectives used to describe the amazingly colorful display of its variegated leaves. 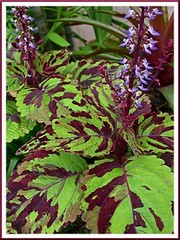 S. scutellarioides, a species of the genus Solenostemon and formerly known as Coleus, are well-known for their ornamental foliage that come in a wide range of impressive coloration and patterns. Absolutely marvelous plants to have, providing constant beauty and color to one’s garden and landscape. Plant type: Tender perennial foliage plants, native to tropical areas of Southeast Asia, extending across the East Indies to the Philippines and Africa, but mostly in Indonesia and Sri Lanka. Now, popularly cultivated worldwide for their ornamental beauty. 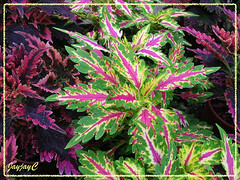 Features: S. scutellarioides (Coleus) are extremely decorative plants, grown and prized for their strikingly colorful foliage. Their variegated leaves are presented in a wide range of endless color combination and dazzling patterns, in various tints and shades of green, red, maroon, magenta, purple, pink, orange, gold, yellow, white, bronz, copper, etc. The leaves’ coloration changes too according to the intensity of light they receive or as they age. Complementing the overall beautiful effect is their variable leaf form and texture – either small or large, heart-shaped or narrowly ovate with long pointed tips, velvety and some even ruffled and have scalloped, serrated or fringed leaf margins. Many hybrids are bred and so numerous are the cultivars that you’ll be astounded – we were, when we found there were close to 300 or more! Coleus grow fairly quickly to a height and spread, ranging from 30 cm for the smaller varieties to 90 cm or more (up to 2m) for the tall bushy varieties. 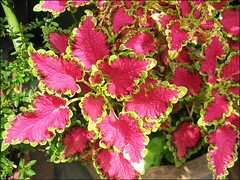 There are also trailing types like the Coleus rehneltianus that are suitable for hanging baskets. In sharp contrast with the stunning foliage, tiny Coleus flowers that bloom on a tall flowering spike above the foliage at terminal stem are insignificant, usually purple to blue and white. 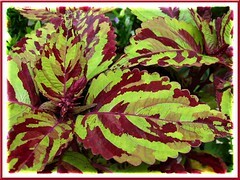 Culture (Care): Coleus are not at all difficult to grow. You can enjoy them with little attention throughout the years, once armed with knowledge of their ideal cultural needs. Light: Grow best and produce vibrant leaf colors in part shade or filtered light. Keep well away from direct sun that will discolor their leaves, unless they are newer sun tolerant cultivars that can thrive in full sun. Moisture: Require adequate water regularly but allow soil to dry slightly between watering. They need fairly humid atmosphere and good air circulation. Soil: Any compost-enriched potting mix, but must be well-drained. Poorly drained soil and over watering may cause diseases or stunt the plants and cause discoloration of leaves and wrinkled leaf margins. Others: Pinch out new shoots frequently to discourage flower buds, stimulate branching and maintain dense foliage. Remove flowers as soon as seen to promote foliage growth. If they become leggy or spindly with age, trim back the older stems to encourage new growth. Feed once monthly with a liquid fertilizer at half the usual strength. If grown as houseplants, provide sufficient bright light and increase humidity, by misting daily or stand the pot on a shallow tray of pebbles filled with water to just below the base of the pot. Coleus are relatively trouble free but watch out for pest such as mealy bugs, whiteflies or aphids and diseases like stem or root rot. For temperate zones: Hardiness: USDA Zone 9-10. 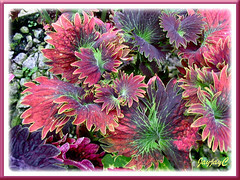 Coleus are grown as tender annuals in cold regions as they are not winter hardy and need warm temperatures to flourish. Ideally, nights should be above 60 degrees F and days ranging 75-80 degrees F, though sun-tolerant cultivars can tolerate higher temperature. Reduce watering in winter, but do not allow soil to be too dry between watering. 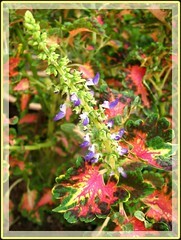 Learn more from RosyDawn Gardens, Coleus growing specialists in Michigan, USA. Propagation: From seeds which should be sown in spring and provided sufficient warmth to germinate. However, the easier and more popular way of propagating is from cuttings taken anytime, which root easily in a glass of water or in soil. Using a sharp knife, cut 8-10 cm long shoot tip cuttings, preferably from non-flowering shoots, cutting below the leaf-joint. Remove the basal leaves, then plant each cutting a few centimeters deep in a 4-inch pot of moist potting soil. Water thoroughly once and place them in a warm place, away from direct sun. Monitor their progress, watering them whenever the top half-inch soil dry out. Cuttings will root in 2-3 weeks. Usage: Mass grow Coleus outdoors as a ground cover in summer or carpet bedding, as front-of-border perennials in home gardens or parks, even below shaded trees for a bright, colorful and dramatic display. Great too for container gardening in all kinds of pots or raised planters. You can even grow a Coleus standard as a specimen or color accent in the ground or container to decorate your garden, patio or porch – learn how-to from the GardenGate Magazine. 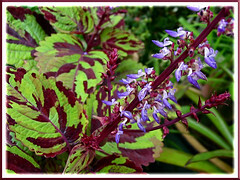 Coleus are suitable for indoors in green houses or as houseplants as well. 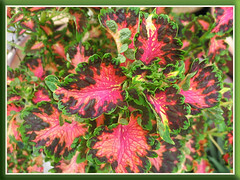 unknown S. scutellarioides (Coleus) cultivar, probably Coleus ‘Shocking Pink’? – fan-shaped leaves with deeply saw-toothed margin that is lined in lemon, with hues of maroon, red and deep purple, and distinctive green venation. 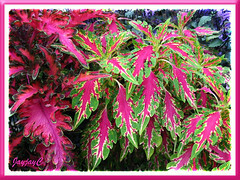 Enjoy more amazing Coleus pictures of the many named varieties, complete with description and info at RosyDawn Gardens. Surprisingly, even with this vast and excellent Coleus catalog, probably presenting 300+ named ones, we’re unable to identify some of the coleus varieties above. Absolutely awesome is mother nature’s endless and magnificent designs! Praise be The Divine Creator! Long live the magical Coleus!